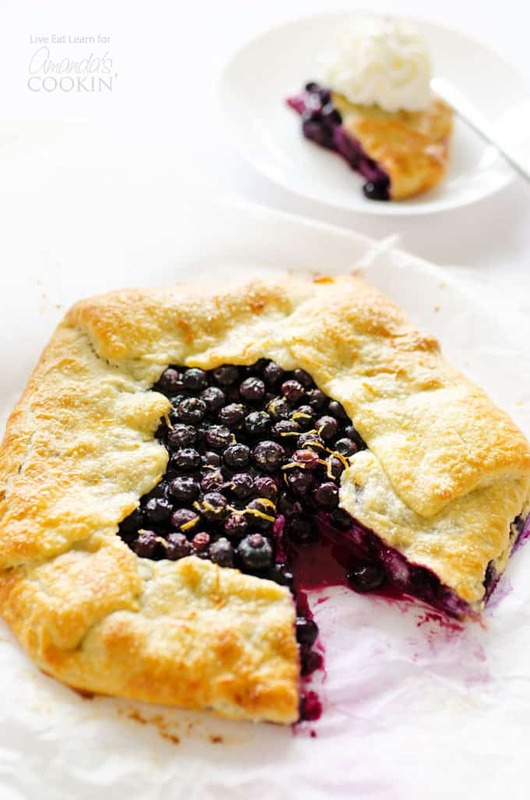 Lemon Blueberry Galette: the easy laid-back version of pie! Love making pies but not all the careful perfection that comes along with it? You’re going to love galettes! 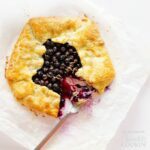 This Lemon Blueberry Galette is a rustic and simple take on pie that’s just as delicious as it is easy. Who doesn’t love blueberry or lemon desserts after all? I’ve always loved baking, in fact, baking really decadent, carb and fat-rich desserts were my introduction into the culinary world. Because what doesn’t take good with loads of chocolate? I mastered the art of the perfect homemade cookies, brownies, bars…you name it. But when I got to pies, I froze. I would always turn into a nervous wreck, checking the oven religiously to ensure the pie hadn’t collapsed or cracked or disintegrated. I even had a dream one Thanksgiving that my pie had completely evaporated! And I guess if a pie is my biggest concern, I’m doing pretty well. To make dough for your galettes, cut the butter into the flour then mix in the rest of the wet ingredients. Refrigerate it to make it nice and hard, then roll out. Slather on a bit of ricotta cheese for creamy goodness. Combine the berries with a bit of cornstarch (to thicken up the juices), sugar, lemon, and salt, then spoon over the ricotta covered pastry dough. Fold up into a perfectly imperfect galette and bake for 30 minutes. It’s that easy! No worrying, no fuss. Galettes are the easy, laid-back cousin of pies. If a galette was a person, they’d be the one that wakes up 5 minutes before they need to go yet still manage to look good. So are you ready to meet galette? How tasty would this pie be paired with a tall glass of homemade Strawberry Lemonade? If you’re a big blueberry fan, don’t forget to check out this Blueberry Breakfast Cake! It’s one of the blogs most popular recipes, and is SO delicious! Or maybe you’re feeling a healthier version to the galette family? Like this Vegetable Rainbow Tart. Filled with colorful veggies, this tart is not only vibrant but deliciously healthy! 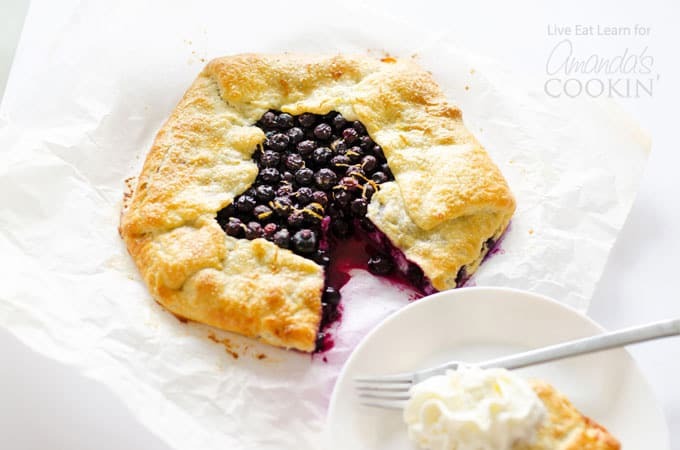 This Blueberry Lemon Galette is a rustic and simple take on pies that’s as delicious as it is easy. In a large bowl, whisk together salt and flour. With a pastry cutter or by hand, combine flour and cubes of butter until butter crumbles are the size of peas. Meanwhile, gently combine blueberries, cornstarch, sugar, lemon, and salt. On a floured surface, roll dough into a 12 to 14 inch circle. Set on a parchment paper-lined baking sheet and spread on ricotta, leaving 2 inches free around the edges. Spoon blueberry mixture over the ricotta, gently pressing down to flatten the mixture. 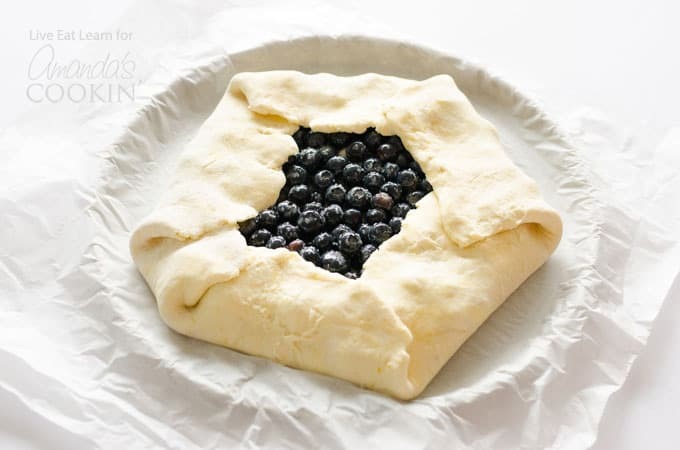 Fold free dough over the blueberries, brushing the dough with whisked egg for a shiny golden finish. Bake at 400 degrees F for 30 to 40 minutes, or until crust is golden brown.